The accident began Wednesday last week when EPA workers accidentally leaked a local mine, releasing concentrated minerals into a stream. The mine had been abandoned for about 10 years, and ground water had accumulated inside it. EPA workers were there to clean up the mine. Now, the mine is leaking at 500 gallons per minute. It still hasn’t been contained, though workers are treating the nearby ponds where the minerals are leaking. Many people who live along the Animas River depend on private wells for their water, but those are now threatened by the river’s pollution. The EPA is sending materials to these residents so that they can test their well water for cleanness. “If these farmers don’t get water in the next week, they’ll lose their crops,” he said. 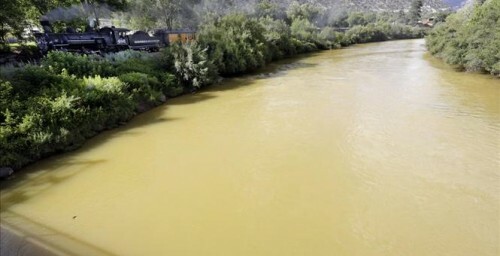 This entry was posted in Environment, News and tagged Animas River, arsenic, EPA, lead, LoRenzo Bates, minerals, Native American, Native American reservation, Navajo Nation, Navajo Nation Commission on Emergency Management, waste by admin. Bookmark the permalink.